Give these two areas some extra love to prevent injury to other areas of the body. Runners know that daily self care is important to prevent injuries—if you are working to maintain the right areas. 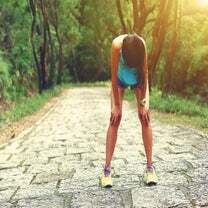 Although this daily maintenance will not make a huge impact if done sporadically or last minute, it is a preventative measure that will make your training—and racing—better. Jill Miller, co-founder of Tune Up Fitness Worldwide/ Yoga Tune Up and author of The Roll Model: A Step-by-Step Guide to Erase Pain, Improve Mobility, and Live Better in Your Body, calls this “prehabilitation,” or the daily maintenance of joints and soft tissues. She shares that because everything is interconnected in your body via fascia, nothing works in isolation, meaning your whole body is a host for dysfunction. “When you are targeting specific areas of your feet or knees, recognize that you are creating an environment for healthy adaptations to occur throughout your whole body,” she explains. When working with runners specifically, there are two key areas Miller says are mandatory for prehabilitation: the diaphragm and feet. She has found that these two key areas are the foundation for injury prevention. This is an area of the body that is doesn’t necessarily come to mind first when working on and talking about self care. “Make sure that your breathing muscles are ‘corganized [by ‘organizing,’ or working on, your core],’” explains Miller. “Your diaphragm can get malalignments and misalignments in its tone from sitting, which can lead to global misalignments in your ribs and spine.” Additionally, because of the diaphragm’s direct relationship to your psoas (or your key hip flexor), neglecting self care can lead to a shortened stride and side stitches while running. The 26 bones in your foot and ankle constantly take a beating—and shoes can confine those 33 joints and restrict their mobility. “That restriction shuts down the vasculature and nerve tunnels and affects how your foot hits the pavement,” explains Miller. RELATED: What Type Of Massage Do You Need? Ashley Lauretta is a health and fitness journalist living in Austin, Texas. Assistant editor at LAVA Magazine, Ashley also regularly contributes to Women’s Running, Active.com, LIVESTRONG.com and more. Find her on Twitter at @ashley_lauretta. Want more running tidbits? Peep our biweekly newsletter and get all the deets on injury prevention, training, nutrition, latest trends in shoes and gear and stories from your running peers.